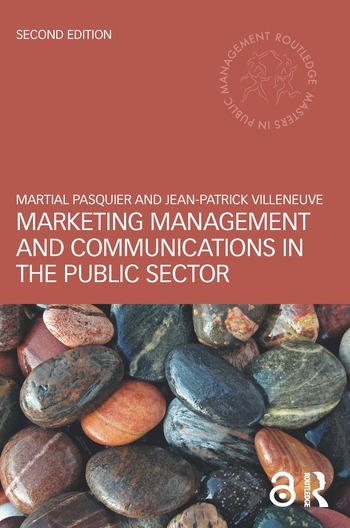 This updated edition of Marketing Management and Communications in the Public Sector provides a thorough overview of the major concepts in public sector marketing and communications, two fields that have continued to grow in importance for modern public administrations. With extended coverage of topics such as social marketing and institutional communication, the authors skilfully build on the solid foundations laid down in the previous edition. Replete with real-world case studies and examples, including new material from the USA, Australia, and Asia, this book gives students a truly international outlook. Additional features include exercises and discussion questions in each chapter and an illustrative extended case study. This refreshed text is essential reading for postgraduate students on public management degrees, and aspiring or current public managers. Martial Pasquier is Vice-Rector of the University of Lausanne, Switzerland, and Professor of Public Management at the Swiss Graduate School of Public Administration (IDHEAP). Jean-Patrick Villeneuve is Professor of Public Communication and Vice-Dean of the Faculty of Communication Sciences at the Università della Svizzera Italiana, Switzerland, and Adjunct Professor at Canada's École Nationale d'Administration Publique (ENAP).